Kevin Bacon freed from advertising as the dirt EE have on him is destroyed. There were dramatic scenes this morning at the headquarters of Everything Everywhere, the UK’s largest mobile phone network, as Kevin Bacon walked free from over a year of captivity following the destruction of a USB stick containing the dirt that EE had on him, which had forced him to perform in adverts for them. The veteran actor, best known for films such as Apollo 13 was forced into performing ignominious vignettes at the behest of executives – knowing that if he failed to enthusiastically endorse the company’s products, they would share with the world the contents of a video that they claimed would destroy his reputation. “It was hard, being made to tell people they were Britain’s biggest network, without point out that this was only because it was the result of a merger, not customer enthusiasm”, Bacon said whilst speaking to reporters following his release, “What they made me do was so degrading, I often wondered if I even had any credibility left to try to salvage”. 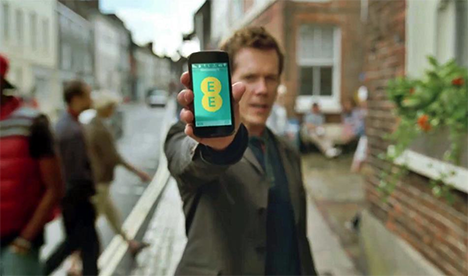 The videos, which were sent to TV stations and cinemas often saw Bacon reprise some of his best known roles to talk about mobile broadband – a process he described as “humiliating”. This has attracted the ire of film fans who argue that Bacon became too complicit. “I played along… because I had to… it was a no brainer… but you can see if you watch the tapes I was dead behind the eyes”, he argued in his defence. The destruction of the data is thought to have come about after a band of regular cinema-goers were shocked by scenes in which Bacon pretended to know who Coronation Street actors are, and that he would frequent greasy spoon cafes. Though the videos acted as promotional tool for EE’s bizarre ideological views, like the Arab Spring, they also motivated opposition to band together to do something about it. Speaking off the record, one vigilante said “I used to love Tremors… even that couldn’t be as horrifying as what they made Kevin do… I just couldn’t take it any more”. Bacon has since released a statement hoping to bring the EE controversy to an end: “I now ask for your privacy, so I may rebuild my career without the threat of an R.I.P.D release hanging over my head”. Unfortunately the above is satire. But we can’t be the only ones wishing it were true, right? Could the Breezie tablet get your Gran online?